Sometimes it’s all about instant gratification. I love a quick fix that refreshes the interior and creates a new perspective. Much like hitting the design “reset” button, small changes can instantly update a space and bring out new interesting details. As you know, I have major commitment issues when it comes to design. These quick fixes help to satisfy my need for change (without breaking the bank) every time I get the urge to see my space in a different light. If you’re like me, your jewelry collection may or may not border along the lines of “Hoarders- Buried Alive” . What better way to add some sparkle to your space than showcase your jewelry? Drape a beautiful necklace around a lamp base… Display bracelets on a tray… The possibilities are endless! An added bonus? You’ll always be able to find that amazing ring that would otherwise be buried in your jewelry box. Books are great display pieces. They can add height and depth to countless vignettes in a space, and they don’t need to be limited to a shelf . Don’t like the binding? Flip the whole thing around and expose the pages for some texture and a more uniform color scheme. 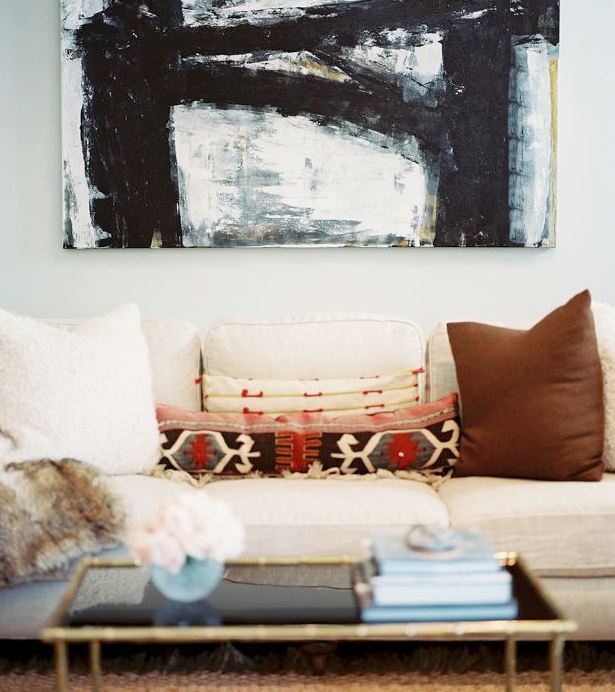 A throw pillow may be small, but it can have a huge impact on a space. It’s one of the easiest ways to transform the feel of a room. Color, pattern, and texture can create a major mood change, ramping up the intensity or toning down the chaos. For just under $4 you can buy a can of Valspar spray-paint and transform any old glass vase (I had a collection of them under my kitchen sink) into a showpiece. I love using a matte white paint to mimic the look of porcelain. Changing out the small things (those things that may not seem like they make a big difference) can breathe new life into a design that seems to be flatlining. Replacing the knobs / pulls on your kitchen cabinetry or changing the color of your lampshades can update your space in just the right way. These are the new pulls and lampshade that I just purchased. I haven’t put them all together yet, but you’ll have the update soon! What are some tricks you’ve used to give your space a quick fix? I love the drawer pulls…for your new dresser?? I also love the idea of spray painting vases. I always seem to amass a collection of the cheap ones that come from the florist with bouquets. Now they don’t have to go in my next Goodwill pile!